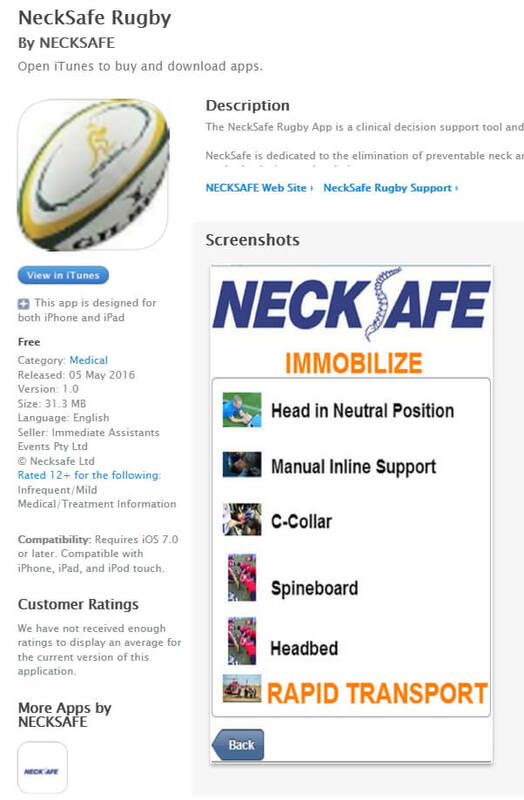 NECKSAFE, Australia’s premier NFP Charity dedicated to the elimination of preventable head and neck injuries though advocacy, awareness, research and education has launched a new NECKSAFE RUGBY APP to complement its existing suite of iOS products. The NECKSAFE RUGBY APP is a clinical decision support tool and a memory aide for those who respond to injured players on the field. Designed using the National Emergency X-Radiology Utilisation Study (NEXUS) and Canadian C-Spine pre-hospital principles, the user is guided through the sequence of decision-making to reach a safe conclusion. The App also has the MAYDAY PROCEDURE for scrum disengagement in the case of suspected spinal injury.